What is your role in the operation of SVA? I have served as the Marketing/Communications Director for SVA since 2013, a full-time volunteer position. My role, in short, is to get the word out about SVA events and to keep members and the public informed of our programming. In addition to writing press releases, overseeing the website, working with the webmaster, administrating facebook pages, developing ads and placing them, creating the annual brochure and calendar, posting events to community calendars, writing newsletters to members and fans, I respond to phone calls and post events on several online calendars, and most recently, became responsible for managing and ordering signage for the exterior of the building. How has your role changed over time? Over time, the role changed mostly due to the addition of tasks. I have a good relationship with the local press so I am able to get our news published in a timely manner. I often recruit volunteers, manage some Final Fridays, ran the Holiday Show and Sale this past year and manned the gallery for three weeks running, maintaining open gallery hours daily. This was the first time the gallery was open for extended hours. It went well. Sales were good. My role remains a multi-faceted, high intensity job. The saving grace is that SVA has always had good graphic designers in the group to work with, thus I’m able to present the group in a professional manner and that helps a lot. Membership has grown fairly rapidly since I joined the group. Shows have been better attended and sales are beginning to increase. Positive comments abound from many area art venues. SVA is doing a good job of promoting. Was SVA always located in the EBCO building? Yes, I believe, SVA was formed in the EBCO building. As a group, I understand that they did hold art exhibits in various venues around town but were headquartered at EBCO. 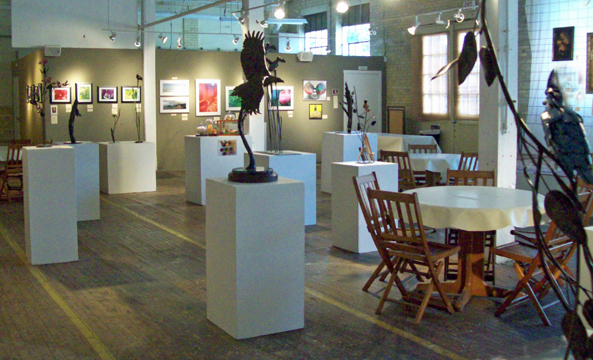 The art studios being rented in EBCO Artworks created a logical increase in exhibits of local artist’s works and also made it possible for the entire group to exhibit in the space. What makes this the ideal location? The location may not be the best, given parking and accessibility issues. However, since it doesn’t cost the group any money to be there, it is the ideal situation to grow an artist-based membership and to encourage them to exhibit and sell their work. 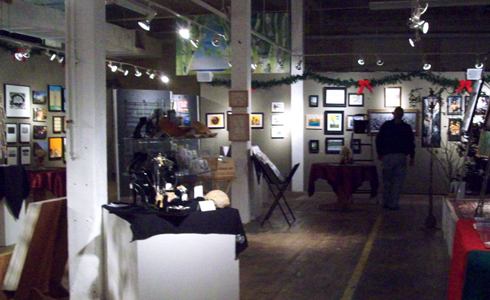 EBCO Artworks space is huge with approximately 5,000 square feet of exhibit space. It also provides ample space to work on and develop instructional programs. There is a full kitchen and bar too, which makes public engagement and entertainment quite easy. What do you feel SVA has brought to the community that did not exist before? 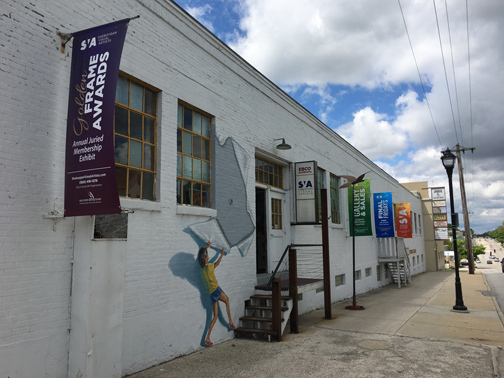 I cannot speak the entire history of Sheboygan with respect to the visual arts, but I do know that SVA has provided a hub for local visual artists of all levels and in all media. 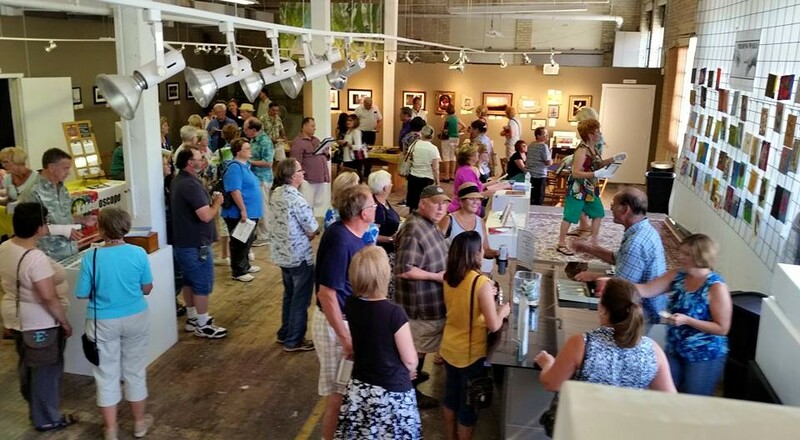 EBCO Artworks, thru the generosity of owner, Tim Ebenrieter, and rent from studio artists, provides ample space to stage exhibits, sell work, and engage the public. It is a great place to gather informally to discuss art and conduct workshops. For example, there is a popular SVA offering called “Art Share” every 2nd Tuesday, 6:30 PM, that brings artists together in a casual gathering to talk about themselves and their work. There are opportunities for member artists to develop workshops for the public to attend occasionally. A weekly Life Drawing session is invaluable to artists and is offered Monday’s 6:30 PM for a reasonable $7 fee. More recently, Open Studio hours are being offered on every other Sunday 2-5PM, Still Drawing is on Wednesdays 2-4PM, Finger Painting Parties on every 3rd Wednesday 6-9 PM. The entire place is starting to pick up energy, however SVA remains an all-volunteer organization with severely limited resources. What is your definition (as an organization) of building an art community? The stated purpose of SVA is to provide local and regional artists with a platform to support, empower and promote local artists and their work. SVA is a growing and active network of visual artists and supporters that enrich the community through the visual arts. Art exhibits change monthly, 10 months of the year, giving all members an equal opportunity to exhibit their work. The exhibits are always free and open to the public. How do you feel SVA contributes to a thriving, progressive and inclusive art community? SVA contributes to a thriving art community by virtue of the number of shows that are conducted each year and the number of artists served. There exists a jury process one must go thru when applying to be accepted into the group. Dues are $40 a year. This is all fine and dandy, but a truly inclusive art community would provide for people beyond the gifted and talented. Individuals with disabilities are underserved due to lack of program development and lack of direct access. There is access to the building thru a freight elevator should the time come when the group has staff and energy to devote to people with disabilities or if artists with disabilities apply for membership. It is not inclusive in that sense of the word. It is inclusive given that public can attend all events for free and artists have the opportunity to show, learn, and improve their art. Membership continues to grow and has now reached 126 members. Attendance continues to increase yearly. All are welcome, free of charge, to attend exhibits. There is a magnetic draw to the creative energy at work in Sheboygan. Artists are beginning to gravitate here because of the art scene. What are a few of the greatest challenges and successes you’ve experienced with SVA? The biggest challenge remains adequate funding and enough dedicated volunteers to maintain the organization. It continues to amaze me that the quality exhibits happen every month with 20% of the group doing all of the work to make those shows happen. This is not unusual in any volunteer organization, but it is challenging and demands much time an energy expended on the part of those who are able to get things done. Thru the efforts of SVA’s new Secretary, a professional project manager, SVA received a grant from the Wisconsin Arts Board. This was the first ever repeating grant SVA has received. However, it was not quite enough to remove the need for dues or to eliminate the Small Works Project which is SVA’s one major fundraiser of the year. Erika L. Block is a professional writer and designer working exclusively with the art, music, publishing, lm and fashion industries. She is also a contemporary mixed media artist. This entry was posted in building art community and tagged advocacy, artdose art guide, community, erika block, sheboygan visual artists, visual arts, wisconsin on June 4, 2017 by Frank Juarez.